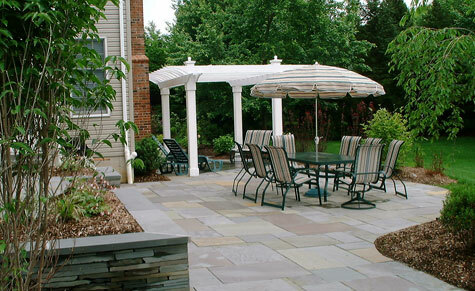 In this project, you can see my patio ideas, which included the materials I chose and how they compliment each other. 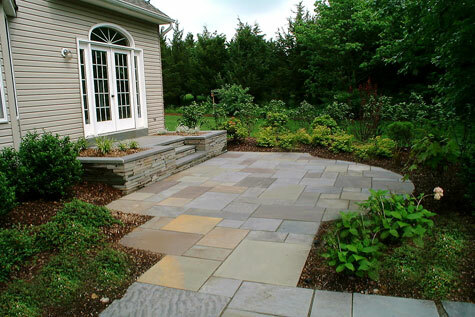 The patio itself is bluestone, which is a very nice natural stone. I use it often in designs where I am focusing on natural materials....and this is quite often! Each piece of bluestone is a geometric shape. In other words, they have straight edges and are not free form. The color has various shades of blues in the mix. This is known as "full range" as opposed to "all blue". I feel this adds interest to paving. The patio shape itself is a mix of straight lines and curves. It is one continuous design, starting with the walkway at the driveway and then leading with patios across the back of the house. And then there is the pergola! The pergola was located towards the middle of the length of the house. The bluestone extends the entire length. 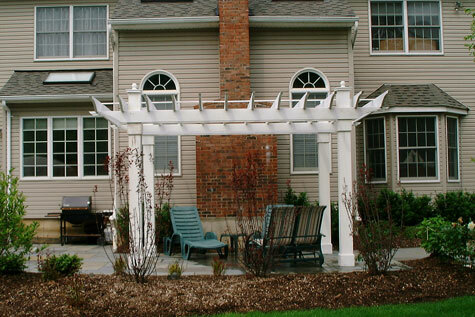 The pergola provides additional interest as it is a lovely architectural feature. It also provides shade. You walk under the pergola to get from one patio to the other. 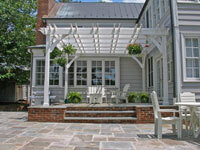 Go to my page on outdoor pergolas to find out more about sizes and costs. There are a few walls due to the fact that the ground level is lower than the inside of the house. I created a large landing with steps. Planters were added at the edges for protection against falling over. I always prefer to do this rather than having a railing. 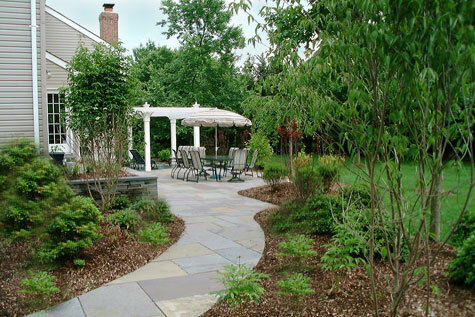 This is also a good ideas for raised patios. The walls were constructed of natural dry laid stone. There are many types of natural stone and the selection depends on where you live. 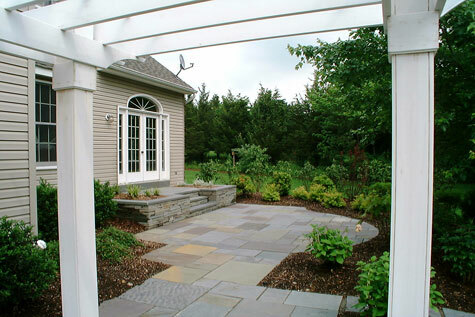 The color of the stone should look well with bluestone. Grays blend well as does stone that is a mix of grays and browns. So....there is the natural bluestone in the design along with natural stone on the walls. Please take a look at pictures of different types of stone garden walls so that you can really see what the differences are and other patio ideas for landings. 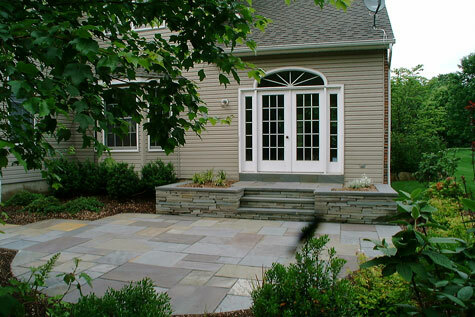 Bluestone treads were used for the steps and were used to blend in with the patio. These treads can be laid in either one continuous piece or you may use a few smaller ones. Just make sure the joints on the treads alternate. The stone on the risers can be either dry laid or it can be face stone mortared to block. Here are photos of some of my projects with different types of bluestone steps. 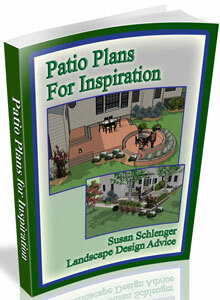 See actual patio plans that I did for some of my clients. There are quite a few 3D images and photos so that you can really see what the designs look like. This book provides helpful ideas and professional tips too.